Other programs in Maryland also received high rankings, including the online degree programs for engineering at Johns Hopkins and the University of Maryland, College Park, and the online Master of Business Administration at College Park. The report ranked 1,545 online programs, including both bachelor’s and graduate programs, in fields including nursing, education, business, computer information technology, criminal justice and engineering, as well as a general ranking of bachelor’s programs. The rankings considered a variety of factors, including student engagement, faculty credentials, and student services and technology. They only considered degree-granting programs at regionally accredited institutions that are offered primarily online. Three Maryland universities received rankings for their online nursing programs, including Johns Hopkins University’s No. 1 ranking. Stevenson University ranked 126th and Salisbury University fell in the 132-170 range, where universities were listed alphabetically. Johns Hopkins had one of the best information technology programs, ranked fifth in the country. The University of Maryland, Baltimore County, was also ranked in this category — 19th. 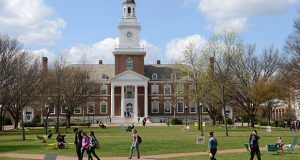 Johns Hopkins and the University of Maryland, College Park, also had some of the better online engineering programs in the country, ranked 14th and 20th, respectively. Four Maryland universities were ranked among the top online MBA programs, including the University of Maryland, College Park (8); Salisbury (113); the University of Baltimore (113) and Frostburg State University (131). Morgan State University’s program was unranked. Five Maryland universities were ranked for their online education programs: Frostburg State (126), McDaniel College (154), Towson University (159), Morgan State (205) and Stevenson (222). Two Maryland universities were ranked for their general online bachelor’s programs: Frostburg State at 123rd and Stevenson at 159th.